← How European Appliance Brands Started in the U.S.
Now, it’s time to discover how American appliance firms Maytag and Whirlpool fared in their European ventures. In the late ’80s, American appliance manufacturers began eyeing opportunities to make acquisitions across the Atlantic prior to the formation of the European Union. In 1988, Whirlpool struck a joint-venture deal with the Dutch conglomerate NV Philips to acquire 53% of the their European appliance division for $381 million. The joint venture gave Whirlpool 3 years of working inside to assess the real value of the Philips appliance operation and develop a strategy to move forward. Whirlpool then purchased the remaining 47% for $630 million, and proceeded to rebadge the Philips brand as Whirlpool. Today, Whirlpool is the largest pan-european brand on the continent. Whirlpool did not enter Europe merely to have European appendages – what CEO David Whitwam called “flag planting”. Their big idea was to integrate their operations globally. By leveraging their expertise throughout the organization they could save costs and improve quality. Whirlpool also took a global approach to their talent. Today, CEO Jeff Fettig, President of Whirlpool International Mike Todman, and Whirlpool U.S. President Mark Bitzer, all are former managers of Whirlpool’s European operation. Maytag, embarked on its European adventure in 1989 by purchasing Chicago Pacific, owner of Hoover, for nearly a billion dollars. This gave Maytag the foothold they wanted in Europe. Known in the U.S. for vacuum cleaners, in Europe, primarily the U.K., Hoover was also a full-line appliance brand. Maytag’s European expansion was marked by one of the biggest marketing blunders of all time – The Hoover Free Flight Fiasco. 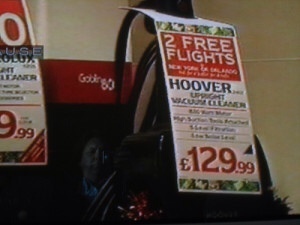 In 1992, saddled with warehouses full of Hoover vacuums that were not selling, UK management came up with a promotion to give away 2 free round trip airline tickets from England to Europe with a Hoover purchase over £100. Of course, the cost of the flights was several times the cost of the vacuum cleaner. Managers banked on the fact that 1. consumers would upgrade to more expensive models, 2. a fair percentage of purchases would not get redeemed, and 3. the loopholes and fine print in the offer would deter customers from participating in the free flight offer. They were wrong. Consumers bought unneeded vacuums just for the free-flights, and fought back when Hoover stumbled and stalled in providing flights. By the time this fiasco ended, it cost Hoover £49 million, 3 executives were fired, and the Hoover Free-Flight Fiasco went down in the annals of marketing as perhaps the biggest marketing blunder of all time. Unable to turn things around at Hoover Europe, Maytag eventually sold the European division for a $130 million dollar loss. In 2006 Maytag was acquired by Whirlpool. This entry was posted in Appliances, Management and tagged Hoover, marketing, Maytag, Whirlpool. Bookmark the permalink. Just returned from IFA in Berlin. Very interesting to see all the product being produced by European Appliances Companies. But clearly the most impressive presentations were from LG and Samsung. They clearly have taken the top spots in the area of innovation.